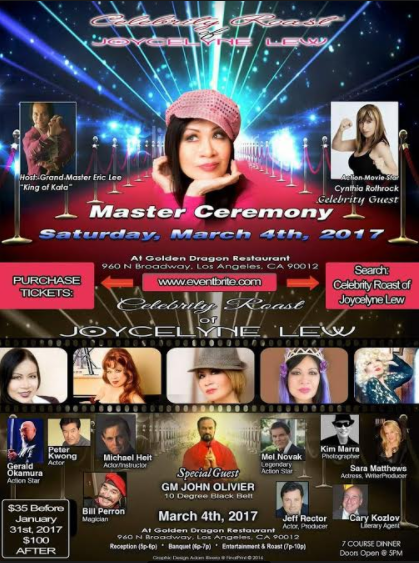 Los Angeles, CA , February 18, 2017	(Newswire.com) - ​​​​​​​​​​​​​​On Saturday, March 4th, 5 p.m., award-winning actress Joycelyne Lew (The Big Brawl, Mad Cowgirl) will be roasted by some legendary stars of screen and martial arts. 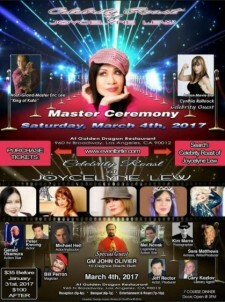 Confirmed celebrity roasters in attendance: Mel Novak (Bruce Lee's Game of Death, Chuck Norris' An Eye for An Eye), Cynthia Rothrock (Tiger Claws III, Lady Dragon), Gerald Okamura (G.I. Joe, The Rise of Cobra, Mortal Kombat), Peter Kwong (The Golden Child, Big Trouble in China), Host Grand-Master Eric Lee (Rambo: First Blood Part II, 3 Ninjas) and many more. Other celebrities expected: Hank Garrett (3 Days of the Condor, G.I. Joe, The Animated Series), Vida Ghaffari (Holy Terror, The Mindy Project), multi award-winning filmmakers Thomas J. Churchill (Check Point, The Rack Pack) and Gregory Hatanaka (Samurai Cop 2: Deadly Vengeance, Blue Dream). 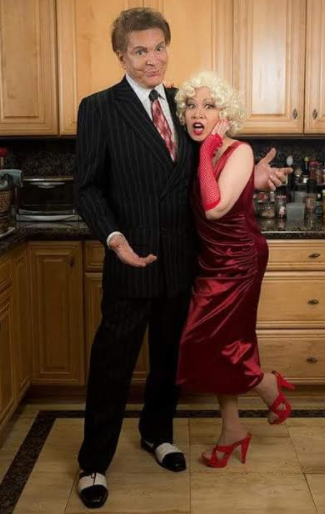 "I have set up Chuck Norris in An Eye For An Eye, beaten up Steve McQueen in Tom Horn, almost set Yul Brynner on fire in The Ultimate Warrior and shoot Bruce Lee in the face in Game of Death, but that is nothing in compared to the roast I'm going to give Joycelyne!" exclaimed Novak. "Had a blast guesting on Joycelyne's cooking show! She is such a great artist and chef, that she even taught a Persian woman (yours truly) how to make hummus!" joked Ghaffari. She has been recognized and listed in "The Who's Who of Women", and she is on the Blue Ribbon Committee of the Emmy Awards, and the National Endowment for the Arts Judging Committee for Film Grants. Her ability to mimic characters using many accents has led to her demand as a voice-over artist. Joycelyne re-dubbed the lead in Bernie Casey's directoral debut, The Dinner. She also has done cartoon voices for Hanna Barbara, industrial narrations, trailers for features, commercials, and dramas on National Public Radio. 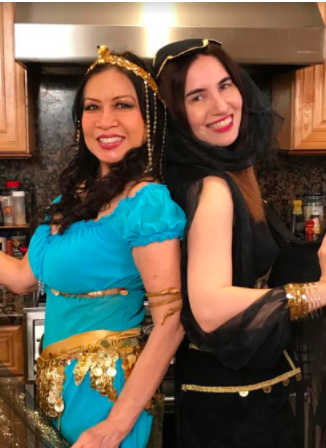 Joycelyne also hosts a cooking show called Cooking In With Joycelyne. The press check-in for the roast is at 4:30pm, red carpet reception starts at 5pm, the 7 course banquet dinner is at 6pm, and the entertainment and roast is at 7pm. The roast will take place at the Golden Dragon Restaurant, 960 N. Broadway, Los Angeles 2017.